Grab the leashes, guys. Melbourne’s fave pooch parade is back on this weekend, with Barkly Square throwing open its doors for the third annual Barkly Barks Festival. If you missed last year’s do, here’s what you can expect. 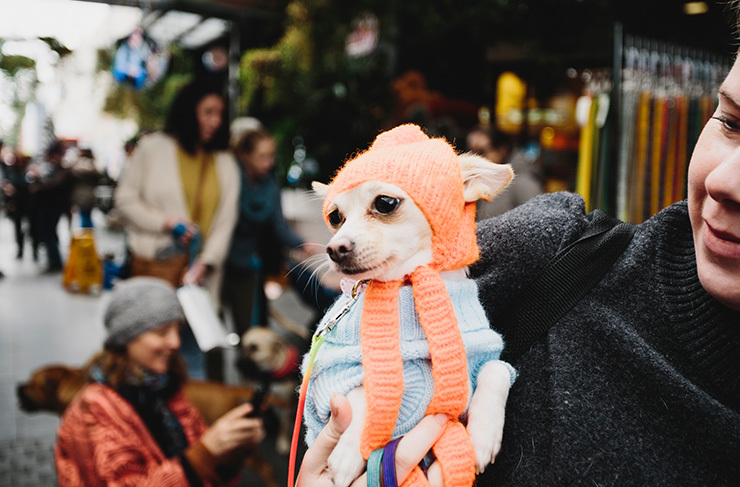 The much-loved dog parade, dog costumes, pop up stalls, awkward Dog family portraits, and rounded up with a Daschund Dash. Just think of their little legs—dogs seriously are man's best friend. Plus, this year you finally get the chance to show off all that pointless (...we mean, valuable) canine expertise with the festival's inaugural Dog Trivia. If you know the world's fastest dog, the difference between a poodle and a groodle, or famous TV pooches so well they may as well have been your childhood pet, now is your time to shine. Want a snap to remember the special day? Crowd favourites Awkward Portraits are BACK this year, snapping hilarious (and very awkward) dog costume pics. First-in best-dressed for this one. If your pup gets hungry, Melbourne's only dog-friendly food truck, Canine Wellness Kitchen will be on-hand with seasonal treats and homemade bone broth (Is it just us or does that menu sound strangely delicious?). Expect lots of food for humans too. The guys at Barkly Square always put on an excellent show. There'll also be a doggy day spa and live tunes running all afternoon. Err, did we mention there'll be dogs there? Need a break from your furry friends? Why not check out the Italian Food and Wine Festival on this weekend.